The HPC cluster at Sussex was originally formed out of two separate clusters developed by IT Services (ITS) and the School of Mathematical and Physical Sciences (MPS). That later merged into what is now the university’s cluster. The hardware that makes up the compute nodes is quite varied, reflecting the number of different groups within the university that have contributed money and hardware at different times. 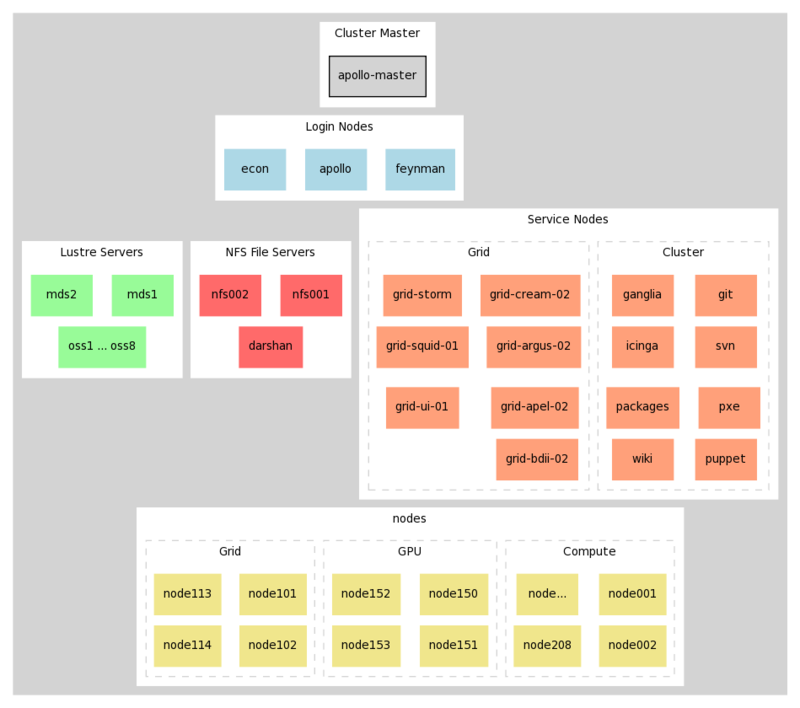 Master - Cluster management node, for privileged users only. Login - Your primary gateway to the cluster; for submitting your jobs. NFS - File servers for home and research storage. Lustre - Specialised distributed file system for I/O intensive jobs. Cluster - Deployment, monitoring and other services for the cluster. Grid - GridPP infrastructure servers. All CPU’s are AMD64, x86_64 or 64 bit architecture, made up of a mixture of Intel and AMD nodes varying from 8 cores up to 64 cores per node. The highest memory node in the cluster has 512GB of RAM across 64 cores. It is safe to assume you can address 2GB of memory per slot when profiling jobs on the cluster. See Running Jobs for more infomation about slots and how to allocate resources for your job. When running batch jobs, the scheduler will distribute your work to the compute nodes. You don’t interact with the nodes directly. Alternatively, the batch system allows you to use the system interactively, i.e. perform tasks in a shell environment. You must avoid running jobs directly on the login nodes. Grid - Nodes dedicated to running jobs for GridPP infrastructure. Currently all administrative and compute nodes use SL 6.5 (Carbon). Service nodes use a mix of SL and CentOS 6.5.